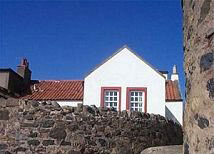 Christmas is the perfect time to escape to a cosy Self Catering Holiday Cottage in Fife Scotland. Get wrapped up and enjoy a bracing beach walk. Leave the car at kirkcaldy and get the train to Edinburgh for shopping. Or drive to St. Andrews in fifteen minutes. Or, simply lock the door and enjoy the cottage. Whatever you choose to do, Castaway Cottages are a great getaway at Christmas. Xmas and New Year Short Break near St Andrews, for shopping, sightseeing our just to relax.